The BBMF has at last announced that there will be a Lancaster flyover at Derwent Reservoir (the Ladybower Dam) on Thursday 16 May between 1300 and 1315. However, access will be severely restricted – no tickets are being issued, parking is severely limited, and the roads will be closed if they become overly busy. See here for full details. The Lancaster flyover will be followed by modern day Tornadoes from 617 Squadron. The aircraft, which are expected to comprise the Lancaster, a Spitfire and a Hurricane (although this is not specified), will then fly on to Chatsworth at 1320 where, the RAF is keen to tell you, there is plenty of parking (costing £3 per vehicle) and opportunity to take pictures. This may well be the better option unless you are willing to spend a lot of time either hiking cross country to the dam or waiting in very long traffic queues. 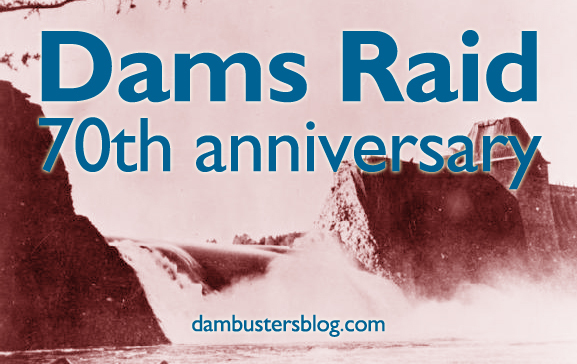 More details about other Dambusters 70th anniversary events will be posted here tomorrow. Please note: In commemoration of the 70th anniversary of the Dambusters raid, the British aviation artist Gerald Coulson has recently painted a superb new work entitled ‘617 Low to the Dams.’ The painting depicts the Lancaster flown by Wing Commander Guy Gibson as he leads 617 squadron on their way to the Dams on the 17th May 1943 and shows the famous bouncing bomb in situ. To see the painting and other original works by Gerald Coulson please visit York Fine Art at 83 Low Petergate, York, North Yorkshire, YO1 7HY. Thanks to Severn and Trent we have an absurd memorial flight. My children attended the 50th anniversary flight on the banks of Ladybower, with their school, as did most schools in the area. How come the risks have increased so much in just 20 years???? Thanks for this update, I’ll by cycling from Hunters Bar, Sheffield to Derwent so hopefully will avoid closed roads, but might get a drenching looking at the weather forecast!